This week will be especially interesting for skywatchersbecause of a fine array of bright planets in our evening sky. In fact, four ofthe five bright naked-eye planets are now readily visible beginning about 45minutes after sundown. Venus is the most obvious. It is bright enough to showthrough the blue sky soon after sunset. Even though its greatest elongationfrom the Sun won't be until June 9, Venus reaches the summit of its currentevening apparition this month, appearing at its greatest height in the eveningtwilight for the year 2007. Venus now shines at a dazzling magnitude of ?4.2 (more than13 times brighter than Sirius, the brighteststar in the sky) and stands nearly 40-degrees above the western horizon atsunset (your clinched fist held at arm's length measures roughly 10-degrees inwidth; so 40-degrees is roughly "four fists" up from the horizon). Venus is now staying up very late, well past 11 p.m. formany locations. On Saturday, May 19, Venus and the crescent Moon will make fora stunningsight for North Americans, as the two objects will descend down the westernsky side-by-side, only about one degree apart. I wouldn't be at all surprisedif local media outlets receive a bevy of phone calls that evening all askingwhat that "strange light" (or UFO) is tothe left of the Moon. Meanwhile, another brilliant light is pushing its way upinto the southeast sky during May evenings: Jupiter. This week the giant planetrises around 9:30 p.m. local daylight time; by month's end, it's rising closerto 8:30 p.m. and is already above the horizon as darkness falls. Jupiter shinesat a brilliant magnitude of ?2.6 (about one-fourth as bright as Venus). To itsright or lower right is Antares, the red 1st-magnitude heart of Scorpius, theScorpion. The full Moon will be passing to the south of Jupiter during the dawnhours of June 1. Consider some of the contrasts between Venus and Jupiter: Venus is a sisterEarth in size, but so shrouded in dense, hot clouds of carbon dioxide that itsbrilliance in our sky is largely due to its high reflectivity (about 76percent). Jupiter on the other hand, is an entirely different type ofplanet?gigantic, surrounded by a thick atmosphere composed chiefly of methaneand ammonia, and icy cold. Ordinarily it appears second only to Venus inbrightness, its remoteness being compensated by its great size. Its surfacearea is 130 times that of Venus. And have you ever wondered how the ancient Romans happenedto name Jupiter after the most powerful of their gods, even though they knewnothing of the planet's physical characteristics? Sitting roughly in between Jupiter in the southeast andVenus in the northwest is the ringed beauty of our solar system, Saturn. Saturn appears as a moderately bright yellowish-white "star"very close to the border between the zodiacal constellations of Leo and Cancer,and about 11-degrees west (to the lower right) of Leo's brightest star,Regulus. Saturn can be found more than halfway up in the southwest sky asdarkness falls during May. It will set this week at around 1:30 a.m. localdaylight time; about an hour earlier by month's end. A telescope magnifying 30-power or more will reveal that thefamous ring system is tilted about 17-degrees from our line of sight. Thenearly first-quarter Moon will lie to the left of Saturn as darkness falls onMay 22. Finally, late May provides us with an especially favorableapparition of Mercury for NorthernHemisphere observers. This orange-yellow-hued planet currently rivals all thestars in brightness save for the two brightest, Sirius and Canopus. It caneasily be picked up in binoculars shining through the Sun's bright afterglow.Just look for it far to the lower right of Venus near the west-northwesthorizon; Mercury will be the brightest starlike object down there. Mercury has its best evening apparition of the year duringthese next two weeks (for observers in the Northern Hemisphere), as an easynaked-eye object and setting near the close of evening twilight. Althoughslowly fading, the little planet gains altitude rapidly day by day. By May 27it climbs to within 22-degrees of Venus. Then, for about the next ten daysthese two planets will seem to stay almost fixed in their respective positionsabove the dusk horizon. 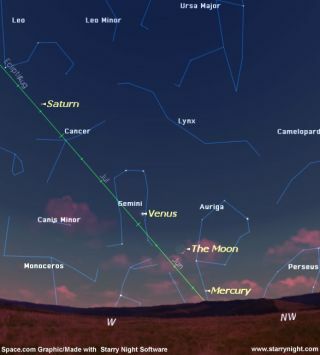 On June 2, Mercury will stand at greatest elongation,23-degrees east of the Sun. During the following week it will rapidly fade asit circles back into the glow of the setting Sun.